Whether it’s your 20th visit or your first-and-last appearance, it’s easy to appreciate the blue-collar work ethic of Hong Kong Migak’s owner, workers and assorted customers the City Hall establishment attracts. In light of how quickly restaurants in the area change proprietors, set up and take down, or just fade out and dissolve like the trendiest K-pop star, you can consider the place an institution. “I live hard and do the best for my living,” said 62-year-old Lee Deuk Seon. She’s the mother of owner Im Chang Beom and looks as if she entered a few beauty pageants in her youth. A patron will very soon remember her and the food streaming out of Hong Kong Migak’s kitchen. The reviewer happened in here — once again — this time with a co-worker who had never been. We ordered the deep-fried shrimp with cream sauce (saeoo keurim soseu) for 25,000 won and the sautéed sliced beef with pimentos (gochoo jabchae), which goes for 20,000. However, take note, any large dish order at the Hong Kong is practically enough for two people. The deep-fried shrimp deserves special attention. According to Lee, the menu choices rarely change. 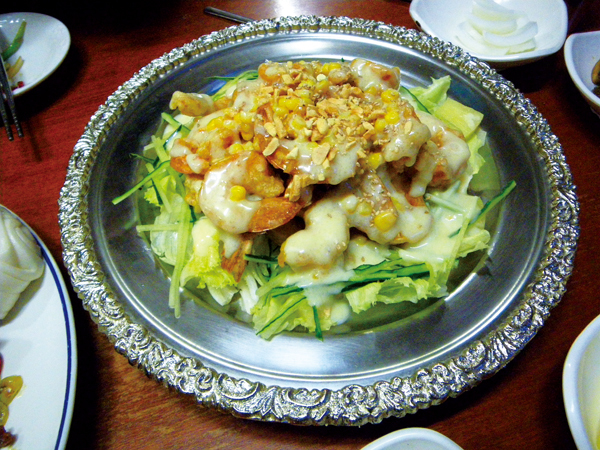 The current rendition of the fried-shrimp creation sees it mixed in with lettuce, corn, cucumber strips, and pineapple slices and plastered in cream sauce. The healthy size of the shrimp and its plump, meaty interior mitigates any thought of a crispy outside. The cream sauce is a concoction of mayonnaise, milk, lemon, and probably some yogurt. It’s sweet, duly noted, and a topic of several past and future food conversations. In addition, the menu provides four forms of sweet and sour (tangsooyuk) pork: Sandong style, Suchuan style, Beijing style, and seafood and mushroom, all priced between 13,000 and 15,000 won. The sautéed sliced beef with pimentos has a nice dose of peanuts, and the dish is served with four light and fluffy dough rolls. At Hong Kong Migak, various types of single serving steamed rice or fried rice (bokkeumbap), noodles with black bean sauce (jjajamyeong) and spicy seafood noodle soup (jjampong) can be had for between 4,000 and 8,000 won. If in doubt, ask for the English menu, although the Korean one is more current. The prices dropped a smidge, and there are a few summer items. The owner, Im, learned the art of cuisine from Gangnam’s famed Lotus Garden chief chef, Ng Shi Pui, for two years. Prior to the Hong Kong Migak restaurant, mother Lee, a Daegu native, had eight years of assembled kitchen experience in Chinese, Japanese and American style cooking. Around 10 foreigners drop in here each week. Many are repeats. Also, due to communication abilities, Lee said some Chinese and Japanese natives enter, and, of course, a lot of Jeju residents. There are two sides to Hong Kong Migak. As a foreigner, this reviewer will rave about having something non-mainstream to eat in a come-as-you-are atmosphere. No mirror checks are needed before entering. Also, in the last three years, all chicken menu transformations have been thoroughly positive. On the flip, a co-worker said some Koreans may find the flavor a bit too strong and greasy. In talking with native Chinese people, I learned that most Chinese food on the island is Koreanized. Here is not the exception. The thinly sliced yellow-died mu (radish), onions with black sauce, and mu kimchi as side dishes serve as a reminder. Regardless of palate preferences, another reason to come in and out of the long dungeon-like corridor any night of the week can be the small (or large) bottle of Chinese firewater. Breathe and be brave.